No matter Bill says how friendly M$ Windows is. It is eating more and more my free disk space. Toady I figured out some tips for releasing disk space. In Windows file explore, you can not see the folder size without checking on property. So you may need a tool, something like FolderSizes. FolderSize helps me to know more about my heard diver. It shows me there is a folder ‘System Volume information”, this folder is 6.20GB big. What the hell is that??? I can not even see it in file explore. Then I check on Folder Options, here are so many hiding options for you. In order to take out that big folder, I unchecked ‘“Hide protected operating system files and folders”, then the folder shows up. But I can not open it sine I really wants to know what hell is been hidden in that folder. 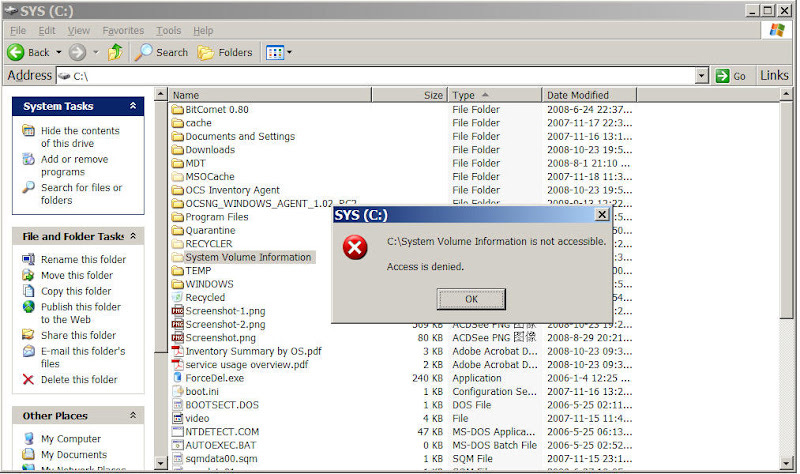 A error message box popup up”Assess is denied.” WOW this is my laptop, I am not able to access the folder. Is this a M$ asset? In FolderSize, I can go inside this folder; it has so many files. Everything in this folder looks like patch file. I have no idea where and when it went down my computer; or this dame OS made it. Now I’m deleting these files and folders in folder ‘System Volume information” from FolderSize. Another error message box popup up; it says “Cannot delete XXX000.ps1: It is being used by another person or program”. Kidding me? Does anyone share this laptop with me at this moment? Fortunately I have openSuSe, I issued rm -rf command after booted into openSuse. Now 6.2GB space was released.